Kay Hunkins has all homes for sale in the Triad and Triangle areas of central North Carolina, from Winston-Salem to Raleigh. These include real estate foreclosures, FHA VA HUD properties, short sales, new homes, acreage, farms, luxury properties, townhomes, condos and investor property listed through Realtor MLS and for-sale-by-owner. 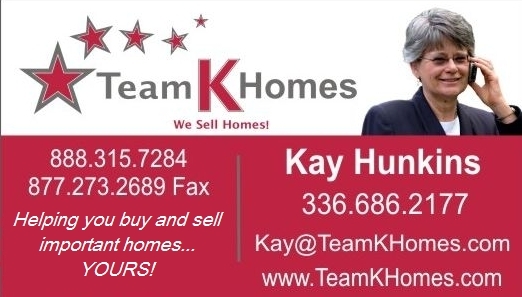 Kay sells homes in Burlington, Greensboro and Mebane North Carolina! In Alamance County NC Kay will show you all homes for sale in Burlington 27215 27217, Mebane NC 27302, Elon 27244, Graham 27253, Gibsonville 27249, Haw River, 27258, Swepsonville, and Saxapahaw 27340. Need homes near Elon University, ARMC Hospital, LabCorp or Tanger Outlets? Kay will find the right home for you. In Guilford County NC Kay handles homes for sale in all price ranges in Greensboro NC 27408 27410 27407, High Point NC 27260, Jamestown 27282, Oak Ridge 27310, Summerfield 27358, Pleasant Garden 27313. Kay has experience with homes for sale convenient to UNCG, University of North Carolina at Greensboro, Guilford College, Greensboro College, A&T State University, Moses Cone Health System hospitals, Wesley Long Community Hospital, Women's Hospital, and major employers. Kay has lenders with the best mortgage interest rates and loan programs on the planet! FHA, VA, Conventional, USDA, CHIPS (Community Incentive Loans), NC Housing Finance Downpayment Assistance, and local bank loans. Kay has home inspectors, attorneys, builders, repair contractors and whoever is needed ready to help take your home to closing on time with minimal effort. Kay Hunkins began her real estate career in 1988 in the Triad area of North Carolina. Her over 25 years experience makes her a favorite with buyers and sellers of all types of real estate: from luxury homes to foreclosures, from townhomes to condos, from land to subdivisions, from realtor listed homes to for-sale-by-owner properties, Kay can help you with your purchase. 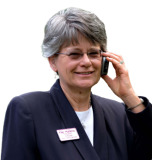 She has lived in the Triad area all her life, and knows the local real estate market well. Kay has watched Greensboro, Winston-Salem, High Point and Burlington grow responsibly, and witnessed small towns like Mebane and Kernersville come alive with fun and healthy family-conscious activities and opportunities. Kay is a master negotiator. Her clients say Kay's extensive knowledge of the local market and creative ability to negotiate real estate deals is a valuable service to buyers and sellers. Since 1992, her experience as an appraiser has given her clients an edge on understanding the current real estate market. Handling all the details from showings, negotiations, contract paperwork to closing, gives peace of mind to her clients. Whether you are buying or selling, you have a better chance with Kay Hunkins and TeamKHomes.